Tony Boatright's WORF artwork shown affixed to the front of the Window Operational Research Facility as photographed inside Discovery's Leonardo multi-purpose logistics module. A"flat" paper doll, a freshly-baked batch of wedding cookies, acartoon dog, and patches inscribed with a sci-fi alien language are packedamong 17,000 pounds of science experiments, equipment and supplies that weredelivered by space shuttle Discovery early Wednesday to the International SpaceStation (ISS). Lighting thepredawn sky as it lifted off on Monday at 6:21 a.m. EDT (1021 GMT), Discovery launched the STS-131 crew on a 13-day mission tothe orbiting laboratory, where they'll perform three spacewalks and moveequipment into and out of a moving van module called Leonardo. Led by commanderAlan Poindexter, Discovery's crew arrived at the station at 3:44 a.m. EDT(0744 GMT) Wednesday. The sevenastronauts ? the shuttle's last full contingent as the fleet's remaining threeplanned missions are set to fly with one empty seat each ? have packed onDiscovery mementos and creature comforts to bring a bit of home tothe station. They'll return to Earth with many of the same souvenirs to sharespace with those on the ground. Onespecial care package, flown at the request of station resident Timothy "T.J." Creamer, will belucky if it lasts the full day let alone remain when Discovery departs forEarth. Having justthis past week marked his 100th day in space as a flight engineer for thestation's 23rd expedition crew, it's understandable why Creamer might be eagera taste of home ? and that is exactly what the STS-131 crew has for him. Fulfilling arequest Creamer made before he launched last December, Discovery is deliveringcookies from an Italian restaurant he frequented while training at NASA'sJohnson Space Center in Houston. The wedding-style cookies were speciallyprepared for spaceflight by Bessilyn Piazza, whocontinues to follow her late mother's recipe while baking the sand tarts at theItalian Caf? in Seabrook for more than 20 years. "Itwill be the perfect tribute to my mother," Piazza said in a statementissued before Discovery's launch. "I know how proud she would be to seeher sand tarts travel into space." Contacted byNASA to provide samples for the standard pre-flight testing that all"space food" undergoes, Piazza ended up making just one change to thecookies at the space agency's request: reducing the amount of powdered sugarthat normally coats each sand tart. Still, thehalf-dollar size pastries are bound to be a sweet treat for Creamer and hiscrewmates. The experience has been sweet for Piazza, too. "Myfeet haven't touched the ground since I received the news," said Piazza. "This is something I never dreamed would happen. I'm still on cloudnine." Not all ofDiscovery's "sweet" deliveries are edible. Dorothy"Dottie" Metcalf-Lindenburger ? who together with fellow STS-131mission specialists Stephanie Wilson and Naoko Yamazaki, as well as Expedition23 flight engineer Tracy Caldwell Dyson, has established the record for the mostwomen astronauts in space at one time ? has tucked inside her notebook thecrew's honorary fifth female. Standingjust seven inches tall and less than one-tenth of a millimeter thick,"Flat Marie" is the paper doll creation of 5-year-old Marie Plowman.A pre-school student at First Presbyterian Christian School in Spokane,Washington, the real Marie created her flat self as a part of her class's"Flat Stanley" project based on the 1964 children's book by the sametitle. In the book, author Jeff Brown shares the story of Stanley, who'sflattened and then embarks on adventures by being mailed in an envelope. Metcalf-Lindenburger,a teacher herself who was selected with NASA's 2004 educator-astronaut class,is connected with Marie through her friendship with the child's maternalgrandfather, a retired history professor at Whitman College whereMetcalf-Lindenburger graduated. Marie'smother originally e-mailed Metcalf-Lindenburger to ask if she would share someof her training experiences. "Shee-mailed right back and said that she would not only be willing to do that butthat she would be happy to take "Flat Marie" along on the mission aswell," said Stephanie Plowman in an interview with The Spokesman-Review. "FlatMarie" is not the only two-dimensional character on the shuttle. ClaytonAnderson, a fellow STS-131 mission specialist, is flying "Dogie theDoggie," the childhood comic creation of cartoonist Jeff Koterba. Andersonreached out to Koterba after seeing an editorial cartoon Koterba drew about himfor The Omaha World-Herald newspaper in Nebraska. "Lastfall [Anderson] invited me to draw two cartoons that he could take on theshuttle," Koterba explained in an interview with the Political CartoonIndex, a website about editorial cartoons, adding that one would be given tothe World-Herald and the other he would keep. "The cartoon for myself hasto do with Dogie the Doggie." Theone-frame comic, which depicts the spacesuit-ed dog "Dogie" thinking"I finally made it . . . " while spacewalking outside the shuttle,features Koterba's version of another famous comic strip dog. "Dogiethe Doggie was my childhood answer to Snoopy," Koterba told interviewerRob Tornoe, "created in response to my father who didn?t believe I shouldjust be copying characters out of the comics pages." "Copyingcharacters" is exactly what Tony Boatright did to design part of NASA'spatch for the Window Observational Research Facility, a science equipment rackflying aboard Discovery that once installed on the station's Destiny labscience window will enable astronaut-tended and remote-controlled Earth-observationexperiments. Recognizingthat the rack's acronym ? WORF ? was the name given to a character, Lt.Commander Worf, on the sci-fi television series "Star Trek: TheNext Generation" and "Deep Space Nine," Boatright had theidea to use the fictional security officer's native alien language, Klingon, onthe emblem. He contactedStar Trek executive producer Rick Berman's office to make certain that he"wouldn't violate any Star Trek canon." "Weagreed on the Klingon Klinshai, or Mandel, script that had appeared in"The U.S.S. Enterprise Officer's Manual" ... to spell out the nameW-O-R-F," Boatright explained in a discussion forum post he made oncollectSPACE.com. 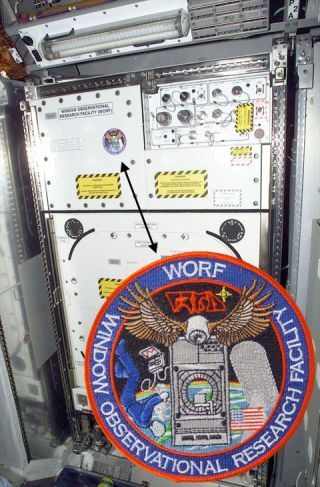 Boatright,who was a member of the WORF development team when he designed the patch in 2001,is proud of the final result. "[By]late next week, I'll have my art (via a WORF sticker on the front of the rack)on permanent display in a fairly exclusive orbital gallery," he wrote. More ofBoatright's WORF patches are stowed inside theSTS-131 Official Flight Kit (OFK), a stash of souvenirs to be distributed toteam members and other organizations after Discovery returns to Earth. Among thoseother items in the OFK are hundreds of the STS-131 mission patch as designed byNASA artist Cindy Busch under the lead of Metcalf-Lindenburger, as well as theJapan Aerospace Exploration Agency's (JAXA) patch for crew member Yamazaki. The latter,a tear-drop shape patch, features multi-colored four-leaf clovers and a rainbowstretching from the space station to Mars. "For meit represents that space holds a lot of possibilities for the future. I hopewe'll continue dreaming about space, and it is that hope that is [symbolized]in the patch," said Yamazaki in an interview with collectSPACE. Clickthrough to collectSPACE.com to view the complete STS-131 OfficialFlight Kit (OFK) manifest.